Poker Winrates | What Is A Good Win Rate? The amount of money you win over a set period of time or hands is known as your "winrate" or "win rate" (I'm not sure if there is meant to be a gap). In poker, winrate is a very interesting topic for a lot of players as the higher your winrate the more money you win. bb/100 = The number of big blinds you win per 100 hands. bb/hour = The number of big blinds you win per hour. $/100 = The amount of money you win per 100 hands. $/hour = The amount of money you win per hour. The most commonly used winrate in tracking programs and on forums for no limit Hold’em these days is bb/100. PokerTracker still uses BB/100, which is twice as much as bb/100, but I'll explain that in a moment. So if you have a winrate of 5 bb/100 in $1/$2 NL, you are winning $10 (5 x $2) for every 100 hands you play. A few other win rates. The following winrates are less common, but just be careful not to get them confused with the ones above. BB/100 = Big Bets per 100 hands. A big bet is 2x the big blind. ptbb/100 = Poker Tracker Big Blinds per 100 hands. This is the same as BB/100. So, if you have a winrate of 3 BB/100 or 3 ptbb/100 in a $0.5/$1 NL game, you would be winning 6 bb/100 or $6 per 100 hands. The reason why BB/100 and ptbb/100 exist is because of limit Hold’em. “Big bets” are double the big blind and are used on the later streets in limit Hold’em. When PokerTracker first came out it measured winrates using double the big blind for both limit and no limit games, so to save confusion the notation "ptbb/100" was used. 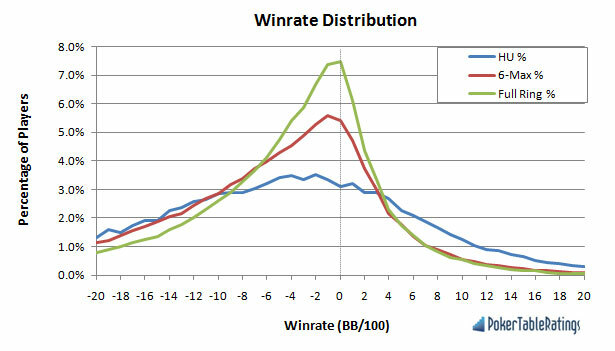 If you're a SNG player and want to find out about "winrates" for tournament games, read my article on poker ROI. What is a good winrate? Any winrate above 0 is good. A winrate above 0 means that you are a winning player and you should be happy about that. Something crazy like 95% of all online poker players lose money, so be thankful that you’re good enough to be in this elite group. However, I know that you’re not going to be satisfied with a very general answer like that. You want some figures don’t you? Rough ballpark figures for good and great winrates. 1 – 4 bb/100 = Great. A solid winrate if you can sustain it. 5 – 9 bb/100 = Amazing. This is a very high winrate at any level. Consider moving up. 10+ bb/100 = Immense. Very, very few have a winrate like this. You probably have a small sample size though. Once again, these are rough guidelines for good and ridiculously good winrates. If yours is much higher, then congratulations to you and I hope it remains high. At the end of the day though as anyone will tell you… you’re doing a good job if your winrate is above 0bb/100, so be happy with what you've got. The vast majority of poker players are losing poker players. Most winning players have a winrate of less than 4bb/100. Whilst winrates of 4bb/100+ are attainable, very few winning players achieve this kind of winrate compared to those that have a winrate of less than 4bb/100. So once again, even though you might have shook your head when I said that any winrate above 0bb/100 is good, this graph shows just how happy you should be to fall in to that category. How can I work out my winrate? The vast majority of players work out their winrate by looking at their stats in HoldemManager or PokerTracker. These programs will tell work out your winrate for you. If you’re not using either one of these programs, you are missing out. If you don’t use either of these programs, then you will have a bit of trouble figuring out your winrate. However, if you do happen to have your total amount won and total number of hands played, divide each side by a number that will turn your # of hands played in to 100 and you will get your bb/100 winrate. Seriously though, just get Poker Tracker 3 or Holdem Manager. See the software page for more information. When can I work out my winrate? 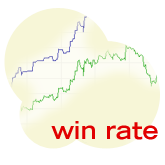 Or to put it another way, when will your win rate become accurate and converge toward your actual long-term win rate? The short answer is it takes A LOT of hands to form anywhere near an accurate winrate. There is a lot of variance in poker, so one month you might have a winrate or 9bb/100 and the next it might be 1bb/100. As far as numbers of hands go, working out a win rate with anything less than 100k hands is prone to a lot of variance. In fact, some would say your winrate wouldn’t be close to accurate unless you hit the 1 million hands mark. Either way, you shouldn’t put too much stock in to your current winrate unless you have a ridiculous number of hands to work with. If you’ve only clocked up 10k hands, expect to see a lot of change. Working out hourly, daily, weekly etc. win rates. So far we’ve just worked with bb/100, which obviously isn’t going to be half as interesting as figuring out your hourly “wage” from poker. Average hands per hour for cash games. 60 hands/hour for full ring games. 85 hands/hour for short-handed games. Turn our bb/100 in to a $/100 winrate by multiplying our winrate by the big blind. Multiply this by the number of tables you play at a time (if you multi-table). Multiply our $/X hands by 0.85 or 0.60 (this turns $/X hands in to $/hour) depending on which game we play. …and we will be left with our hourly winrate. Easy. To get your daily, weekly, monthly win rate and so on, you just multiply your hourly winrate by the hours you expect to play in a day, week, month and so on. You play 4 tables of 6-max 10c/25c NL Hold’em and have a winrate of 6 bb/100 hands. What is your hourly winrate? 6 bb/100 = $1.50 (6 x 25c) per 100 hands at each table. $1.50 per 100 hands x 4 tables = $6 per 400 hands. $6 x 0.85 = $5.10 an hour. You play 1 table of full ring $1/$2 NL Hold’em and have a win rate of 2 bb/100 hands. You play an average of 3 hours a day. What is your daily win rate? 2 bb/100 = $4 per 100 hands. $4 per 100 hands x 1 table = $4 (obviously). $4 x 0.60 = $2.40 an hour. $2.40 x 3 hours a day = $7.20 a day. You play 2 tables of short handed $2/$4 NL Hold’em and have a win rate of 3 bb/100 hands. You play an average of 5 hours a day and play 5 days a week. What is your monthly winrate? 3 bb/100 = $12 per 100 hands at each table. $12 x 2 tables = $24 per 200 hands. $24 x 0.85 = $20.40 an hour. $20.40 x 5 hours a day = $102 a day. $102 a day x ~20 days a month = $2,040 a month. For more on potential earnings, read the article on how much money you can win from online poker. Evaluation of win rates in poker. Aside from being able to work out hourly winrates and so on, there are two main things that I would like for you to take from this article. A winrate greater than 0 is good. Be genuinely happy about it. Focus on improving your game, not your win rate. Don’t ever fall in to the trap of trying to chase after a certain winrate. There are so many variables involved that it might not even be attainable for you, but don’t worry about it. If you focus on playing the best possible game you can, your winrate will be as good as it needs to be. Note: When playing from the blinds, it's actually perfectly standard to have a negative winrate. As outlined in this video on blind play, it's expected to be making a loss from playing in the small blind and big blind. Winrates in poker are fun to look at (if you’re winning of course, they’re not so much fun if you’re losing), but always aim for perfect play, not a specific winrate.